Genma Holmes, a parent to three athletes aged 15-20, says one of her biggest youth sports psychology challenges over the years has been dealing with coaches who are so focused on winning that they undermine young athletes’ confidence. Genma’s 16-year-old son was part of an upper-level team of football players whose coaches insisted on big wins, she says. Even though her son was one of the young athletes who got lots of playing time, Genma didn’t like the fact that less talented kids often didn’t get to play. 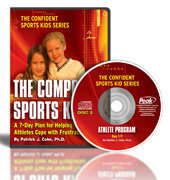 She wanted coaches to concentrate on confidence building in sports. She also thought the coaches should focus more on learning life skills—and less on winning. 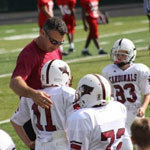 “As my sports kids got into the ages of 9, 10 and 11, the emphasis was just on winning, but not on the game of life. As a sports parent, I wanted my son to learn about team work and not just being the star,” she says. In this situation, how can parents apply some sports psychology? Genma had the right idea. When she decided to give the coach feedback, she always did it when her son and other players were not present. And she chose to talk to the coach when he wasn’t busy coaching. She was always as positive and supportive as possible while she gave her constructive criticism. In addition to talking to the youth coach in this situation, sports parents can help their young athletes focus on the process, not on the product—the score or win. If kids focus too much on winning, they often feel expectations that can undermine their confidence in youth sports. They begin to pressure themselves. This is a common sports psychology challenge. When the pressure sets in, young athletes often start worrying about failing—which is just what Genma’s son did. The pressure has turned into fear of failure, which isn’t a confidence builder and makes sports less fun for her son. When sports parents see their kids worry about failing, they need to focus on confidence building. They should gently try to understand what their kids fear. Help them replace their negative worries about failing with positive statements. Remember: They need to feel positive to be confident. As sports parents, you can help them by focusing on their positive qualities as much as possible. And make sure that your expectations do not pressure your child into feeling afraid to fail.